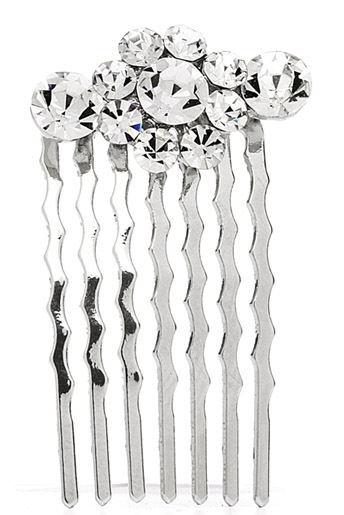 * This petite hair comb will add just the right amount of sparkle to any hair style. * Featuring a cluster of shimmering crystals, Mariell's wholesale hair comb is beautiful whether worn alone or combined with any of our other hair accessories! * Mariell's petite hair comb is perfect for making a subtle, elegant statement at any wedding, prom, or formal event. * At just 1 3/4" h x 1" w, it adds just the right amount of sparkle to any updo without overwhelming your perfect updo.